This week I was working on PayPal integration in Serial Key Manager(http://serialkeymanager.com/). Some time I spent trying to understand how this can be accomplished using a server language, ASP.NET, since I have not been able to find a clear tutorial that would be easy to follow, So, in this guide I am going to outline how the entire process works and provide you with working examples! The first thing you need is to create a PayPal developer account so that you can access this page https://developer.paypal.com/webapps/developer/applications/myapps. When you press on Sandbox accounts to the left of the page, you will have the option to create two types of accounts: Personal or Business. Business account is the account that will receive the payment from the Personal account. Depending on how much your product will cost, you will have to insert an appropriate amount of money into the Personal account. I think you can have as much as you like since it is only for testing purposes. Now, you will have to create two Views in a Controller, one where you have the button and one where you have the validation mechanism. Let’s start with the button! Put the code below into any View. My View name is IPN in the User controller. The example code is based on this code. Please take a look at it to see how it is done with several variables. if (amountPaid == 9 ) // you might want to have a bigger than or equal to sign here! //you might want to show the details of the order, but do not upgrade it! // since the user did not pay the right amount, we still want to log that for future reference. string paypalUrl = useSandbox ? "https://www.sandbox.paypal.com/cgi-bin/webscr"
PayPal provides you with many variables, so I suggest that you take a look at how the response looks like. When you’ve found a value that you would like to save into the database, use the GetPDTValue function to retrieve that value. Want to learn HTML from the beginning? See the video below! $$|z| =z times z^* $$. Using simple algebra, we can rearrange these, and later be able to find an absolute value, given complex number and its conjugate, for example. You might have seen the poster about Computer programming on the IB board (and other places). Let me introduce you what it is going to be about! The idea of this project is to create a group of students interested in programming, mathematics, computer science, etc, and allow them to discuss the current technologies, attend lectures about different programming languages (including cool stuff in math), and investigate related topics (and present them in the group). There is a big benefit for current IB12 to join this group, as it will count as Creativity (to attend the meetings) and Service (when you talk in front of others about something that you like). I will encourage everyone to practice on presenting different topics in front of others in a group, as it is an important skill in many fields! I hope this short summary has given you some introduction, however, if you would get any question, please always ask me (contact here)! Depending on which number is removed in a column, different letters can be obtained. These letters are also printed at the top, so that it is easier to read the information. 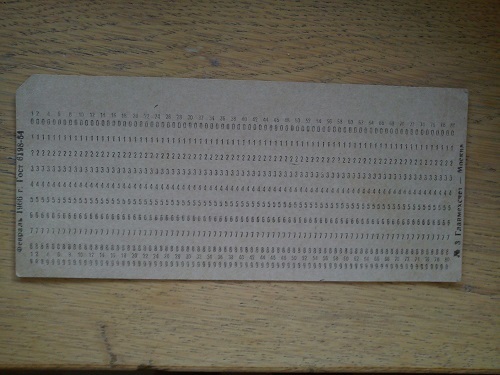 These cards were later combined in a pile, in order to produce a program. The corner is removed in order to be able to identify if it is misplaced easily.